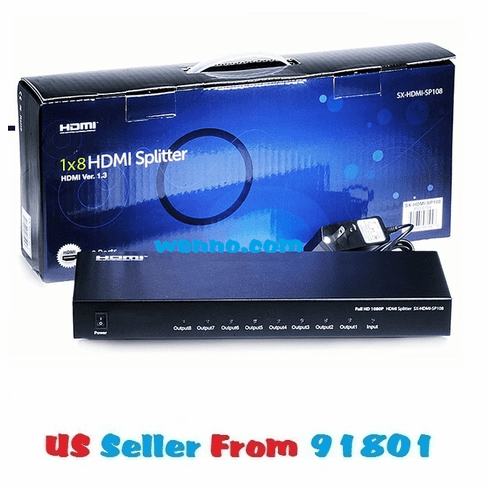 This 1x8 splitter is packed full of advanced technology and will support your equipments latest and greatest features. Offering support for full 1080p resolution, multiple digital audio formats, 24/36 bit deep color, and a data transfer speed of up to 10.2Gbps, this is a splitter that means business at a price that can't be beat! Perfect for any home theater, business, or classroom application. Resolutions supported: 480i, 480p, 576i, 576p, 720p, 1080i, 1080p HDMI/HDCP version: HDMI 1.3/HDCP 1.2 (fully backward compatible with all prior versions) Supports deep color 24bit and 36bit Digital audio formats supported: LPCM, Dolby AC-3, SACD, HBR, DSD Data transfer speed: 10.2Gbps (per channel) Supports output cable lengths of 15m+ with 26AWG or thicker HDMI cables. Power supply: 5V DC 2A output - 100v-240v input Dimensions: 320mm long, 120mm wide, 35mm high Weight: 1120g Warranty: 1 year Stackable: Yes, connect units together to create a larger distribution.